BeldarBlog: Is Barack Obama one of America's 50 most influential lawyers? Is Barack Obama one of America's 50 most influential lawyers? InstaPundit Glenn Reynolds has a polite and useful practice of acknowledging some of the "review copies" of books that have been sent to him, even if he hasn't yet read them, with his short "In the Mail" posts. These usually consist of no more than the author's name and the book's name, typically with an Amazon link (which, altogether appropriately, rebates a small percentage of all purchases back to him through the Amazon Associates program). I think it's fair to infer from such posts that Prof. Reynolds' interest has been piqued by each of the books he so lists, whether or not he ends up reading them. But I certainly don't interpret him to be endorsing all these books, or even necessarily recommending them; when he does want to recommend or endorse something, he's pretty clear about that. Today he has such a link for a paperback by Ross Guberman called Point Made: How to Write Like the Nation's Top Advocates. Like any adversary-practice lawyer with the requisite healthy ego for that job, my first reaction upon reading that title was, of course: "It's not the 'Nation's Top Advocates' unless it includes me." The author takes an empirical approach, drawing heavily on the writings of the nation's 50 most influential lawyers, including Barack Obama, John Roberts, Elena Kagan, Ted Olson, and David Boies. One of these things is not like the other things. One of these things just doesn't belong. Even Elena Kagan — who I thought was a disastrously poor oral advocate during her short tenure as Solicitor General — has at least made an undeniably successful career as a lawyer. David Boies, Ted Olson, and John Roberts are all "lawyer's lawyers," meaning that anyone who knows a damn thing about the practice of law, and in particular the practice of appellate advocacy (a fairly narrow sub-discipline), will indeed recognize them as fine examples from whom much about the art of advocacy can be learned. And there's no doubt that Barack Obama — merely by virtue of the office he holds — is one of the 50, or five, most influential people in the world. But he certainly didn't get that job because of his excellence and abilities as a lawyer practicing law. Indeed, the very best that could ever be claimed for Barack Obama's legal practice is that it was short, sporadic, undistinguished, and unmarred by the drive for either billable hours or courtroom success that most new "litigators" are expected to demonstrate. From his spot as "president" (effectively editor-in-chief) of the Harvard Law Review, he could certainly have found prestigious judicial clerkships and a prime job with almost any law firm in the country. He chose instead to blow off judicial clerkships, to spend the year after graduation writing his book and working on a voter registration project, and then finally to join a small Chicago firm of some local political influence but no national prominence. There, by all reports he alternated between "civil rights" legal work (broadly defined, e.g., protecting apartment dwellers' "civil rights" not to live amongst asbestos contamination) and much better-paying work representing slumlords like Tony Rezko. Indeed, Obama's current Wikipedia entry sums up his career as a practicing lawyer in a single sentence that's quite comprehensive and, if anything, a bit generous: "In 1993 he joined Davis, Miner, Barnhill & Galland, a 13-attorney law firm specializing in civil rights litigation and neighborhood economic development, where he was an associate for three years from 1993 to 1996, then of counsel from 1996 to 2004, with his law license becoming inactive in 2002." 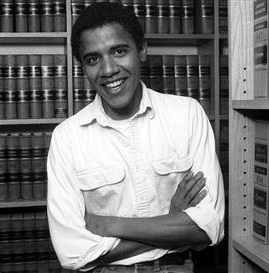 Based on my Westlaw search of federal libraries, Barack Obama was listed as appellate counsel of record in precisely one federal appellate decision, in which he represented ACORN (yes, that ACORN) in supporting Ohio's "motor voter" law — a matter that's almost as much political as legal — and while he might well have written part or all of that brief, he wasn't even the first-chair lawyer on the case. That hardly puts him in the company of John Roberts, Ted Olson, or David Boies as an appellate advocate. Rather, it puts him in the company of about 10,000 other schlubs who've dipped a toe in appellate waters and found them too cold, the competition too intense, and the judges too demanding of excellence. I will grant that Obama was apparently quite popular as a part-time lecturer in constitutional law seminars at Chicago Law School. But that, even added to his law practice, wouldn't make him one of the 50 most influential lawyers in the city of Chicago — much less in the whole country. I haven't bought, and obviously haven't read, Mr. Guberman's book. I wonder, though, if it doesn't rely on Barack Obama's political speeches, rather than anything he's ever written or said specifically as a practicing lawyer. [This bit of speculation was in error; please read the "Update" below. — Beldar] Because I'm here to tell you, ladies and gentlemen, friends and neighbors: When I die, if I ever make it to heaven and the Good Lord gives me some choice over leisure activities, among my top five would be trying any sort of lawsuit, representing any sort of client, in a jury trial on neutral territory against Barack Obama. Somewhere in my top ten would be arguing any appeal against Barack Obama. I would be less keen to face him in a duel of teleprompters, especially if he still gets to have the flags and the "Hail to the Chief" and Nancy Pelosi's Botoxed grin in the background. But if Barack Obama is one of the nation's top 50 most influential lawyers based on his lawyering, his advocacy for a client in any sort of court setting, I will eat my much dog-eared copy of the Bluebook. So let it be understood: Barack Obama is one of the nation's fifty most influential lawyers in exactly the same sense as he's one of the nation's fifty most influential basketball players: He's a President of the United States who happened to dabble in basketball and lawyering. And frankly, I haven't seen any accomplishments from his legal practice that can rival his occasional three-pointer on the basketball courts. Thank you for mentioning my book today and for sharing your thoughts on my inclusion of Obama as one of the 50 most influential advocates. I found your objection to be reasonable, so I thought I'd explain my thinking a bit. I agree that Obama had a short and thin legal career. But he did sign a cert petition in an important Voting Rights Act case (Tyus v. Bosely), and so I thought my readers might be interested in seeing a few excerpts from the brief as an example of the President's legal work in his academic specialty. Like any author, of course, I hope your own readers will buy my book and judge for themselves! Nearly all of the other people whose work I include have had more traditional legal careers. Now I am indeed eager to read the book, not least because I've found so few samples of Obama's work product as a practicing lawyer online. Mr. Guberman has promised to send me a review copy — thus have I leveraged myself unabashedly into the same privileged position as Prof. Reynolds, at least in this one very small particular — and I've promised to read it with the intention of writing a review here in due course. Stay tuned! Editing note: As originally published, the bolded sentence near the end read "dabble in basketball and law." I've changed "law" to "lawyering" because Mr. Guberman's claim is that Obama was one of the 50 most influential lawyers, not "people with a law degree." From at least all superficial appearances, Obama's law degree and law review service were impressive accomplishments — more the pity that he did so little actual lawyering with them. Dear Mr. Dyer: "From at least all superficial appearances, Obama's law degree and law review service were impressive accomplishments..." Heavens, now I have to clean my computer monitor and a really impressive choking fit...The One's Harvard grades are a closely kept secret i.e. the press knows how embarrassing the grades are and won't release them for the same reason John Kerry won't release his service record. The One's Harvard performance is 80% melanin, 19% entitlement and 1% arrogance. If white guilt did not exist, The One would be eking out a miserable existance, full of rage at a Universe that is indifferent, when it isn't laughing at his pretentious antics. Who really takes The One's intellectual pretensions seriously any more? It's all bawlings in an echo chamber, with no substance. I am astonished that you think Harvard is any different. To do so, you have to postulate that for the only time in his life The One buckled down and used his brains, instead of trading on entitlement and melanin. Occam's Razor dictates that the reverse explanation, that The One conned and bullied his peers and profs, is far more likely to be true. There's no record of cases won, of unaided-by-Bill-Ayers publications, no laws-he-drafted-himself, nothing at all. Save for a ferocious determination to rise, that sees every other human face as a ladder rung. Mr. Koster, I know you'll recall mine among the blogospheric voices who speculated about, and chased after, Obama's missing student law review publication, and who argued long and hard about whether he was entitled to be regarded as a "law professor" or "Professor of Law" at Chicago. I, too, would still like to see his transcripts from Columbia and Harvard Law, and I'm still tugging (from time to time) at threads of an imagined post on how Harvard Law has dramatically changed, over time, the percentage of its students to which it's awarded honors, high honors, and highest honors degrees. But I was favorably impressed — not blown away by any means, but on balance more impressed than not, and against my own inclinations — with some of his law school seminar exam questions that have been circulated on the internet. They were competent for the sort of seminar classes he was teaching (although the choice of topics reflected an obvious and pronounced leftward focus, which one would expect from a community-organizer and Dem state legislator). His student law review publication, when finally confessed to, was lifelessly competent — meaning it was very typical of such ruthlessly edited pieces at Harvard or anywhere else. And whether his service as president of the Harvard Law Review was the result of student politics or affirmative-action impulses or whatever, that he was elected to, and served to the end of his term as, president of the Harvard Law Review is a remarkable accomplishment. (Not unlike his 2008 campaign in miniature, I suspect, but there again go I, speculating without a shred of evidence because I wasn't there.) Even at much less distinguished law schools, I've never met a law review editor-in-chief who was a complete dummy, and I did BigLaw recruiting all over the U.S. for a dozen years. So I really am keenly interesting in reading Mr. Guberman's book, which may be more revealing than I had assumed. I'm not only interested in Obama's legal abilities, I'm interested in the extent to which he has or hasn't developed them. I acknowledge that there are strong grounds for skepticism as to the extent of his legal abilities, and I shall try not to take them for granted, but instead to continue to assess them as critically and objectively as I can, given my admitted biases and limitations. Another editing note: I've changed "one federal case" in the text of my original post to "one federal appellate decision," which is more accurate. I was searching the Westlaw Genfeds library, which would not include state court cases at either the trial or appellate level; federal trial court cases that didn't result in a published opinion before appeal (and very, very few do); or (significantly given Mr. Guberman's description) briefs and certiorari petitions that might nevertheless be included and searchable in other Westlaw databases. Were I an ambitious "opposition research" drone for the RNC, I'd go sort through the microfiche or dead-tree or whatever other versions can still be found of all of the Cook County court cases in which Obama entered an appearance. Maybe the Chicago papers, or the real "opposition research drones," have already done that; but I doubt it, and/or doubt the folks that were sent were sensitive to all the potential implications of what they found. But there is inevitably a limit to how much of a lawyer's writing on behalf of clients may fairly be attributed to the lawyer personally: the skill (or lack thereof) displayed in the writing, yes; but substantive positions, usually not (because the lawyer is acting, by definition, not as a principal on his own behalf but as the agent and advocate and mouthpiece for his client). "... I was favorably impressed — not blown away by any means, but on balance more impressed than not, and against my own inclinations — with some of his law school seminar exam questions that have been circulated on the internet..."
": His student law review publication, when finally confessed to, was lifelessly competent — meaning it was very typical of such ruthlessly edited pieces at Harvard or anywhere else. " "...that he was elected to, and served to the end of his term as, president of the Harvard Law Review is a remarkable accomplishment." Why is it a remarkable accomplishment? That's like saying the New York TIMES is a great newspaper today, becuase of its great coverage of World War II. Who, reading the notoriously slanted bunkum about the Wisconsin teacher unions, would think the TIMES is a great paper today? Leave that out. Look at what you've written: "lifelessly competent" "on balance more impressed than not." From this faint, mediocre praise, we conclude The One is one of the 50 sharpest lawyers in the country? Bosh. Bunk. Guff. Hooey. Hokum. Nonsense. Mountebankery. Rubbish. Without being a lawyer, I condemn The One as a witless fool in his lawyering skills. One example will suffice. His signing an Executive Order on 22 January 09 saying the Guantanamo Bay prison would be close din one year. How did that turn out? It's true, I don't know all the facts behind the decision to keep it open. But even I would know enough to make the EO open ended, i.e. "we are beginning the process of closing Guantanamo. This will be long and involved...etc etc etc." Nope, not our boy. He banged along, signing stuff he didn't understand, trusting that because he said it, it MUST be true. The thinking he needed to do before he signed the EO is same sort of thinking a practicing lawyer would have to do. Signing this EO wasn't the action of a skilled, practiced lawyer. It was pure posturing and laziness. The man's a fool, with enough smarts to skate along, but far too lazy to do the hard work of preparation, relying on his conning skills to slide by, not even realizing his own deficiencies. It worked in Chicago. It isn't working as Prez. Small wonder you want to try cases against him in the Celestial Appellate Courts. Put it yet another way: pick Chief Justice Roberts as the gold standard for appellate advocacy, and rate him at 100. Compared to him, what would The One's rating be? Don't like Roberts? Then choose Walter Dellinger. How would The One stack up to him? Or to use an example from the past, how would he stack up to Abe Fortas? The One has nothing to show competence beyond glitter borrowed from institutions he has conned. Take "Harvard" away from him, and set him in court as a trial lawyer or appellate advocate, and you have a ciper whistling in the wind as it falls. Rumor has it that he was pressured to "voluntarily retire" by those in the University of Chicago's law faculty who took umbrage at his misrepresentation of himself as a "professor" when he was only a "lecturer". Mr. Thompson (#7), I've reported on this before in several different posts from the 2008 election season, and I continue to try to be scrupulously accurate about it. Your comment is, I think, not quite right. I don't know if there were individual professors who were upset with the "law professor/Professor of Law" charade, but the institution publicly backed Obama, and none of those individuals, if they were genuinely upset, ever went public on the record. I'm therefore pretty skeptical that there was ever any real institutional pressure for him to step down as an active lecturer, and I just can't credit your rumor to the contrary in these circumstances. As for his license, your formulation is too strong. "Voluntarily retired and not authorized to practice law" doesn't mean he's not a lawyer anymore, but it does mean he's a nonpracticing, unlicensed lawyer. I don't know whether he could get reinstatement or how hard that might be, but I doubt he ever has occasion to seek it (my fantasies of opposing him in court notwithstanding).